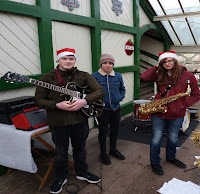 Tynemouth Station Christmas Market. Yes, November isn’t out, yet the Santa hats were out in numbers. 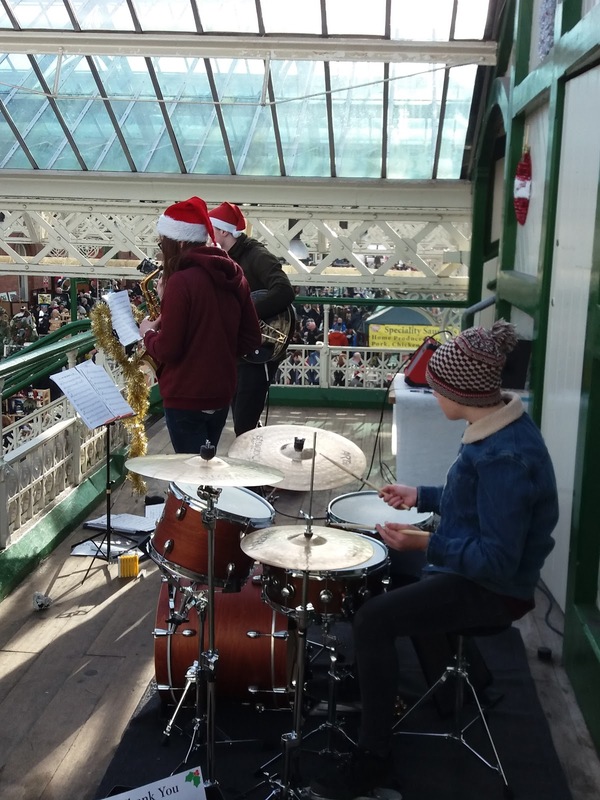 The weekend market on either side of the Metro line is as popular as ever and today there was an added incentive to catch a train from Newcastle to the coast – In Other Words, in Santa and bobble hats themselves, were entertaining late morning visitors to a bustling market. In Other Words (think Fly Me to the Moon) are Alex Thompson, alto, Nathan Lawson, guitar and Dylan Thompson, drums. The chances are you’ve heard them without knowing their names. On Sage Gateshead’s concourse these young men have entertained the crowds in numerous band permutations – Jazz Attack, JB’s Cats (that’s James Birkett’s young charges), Jambone (the big band based at Sage Gateshead) and the Early Bird Band to name but four. Let it Snow! Let it Snow! Let it Snow! (please no, Christmas Eve will be soon enough!). Alex and Nathan donned Santa hats, Dylan a snazzy bobble hat. Beyond the Sea (not too far as the crow flies), Have Yourself a Merry Little Christmas – the trio knew what to play, Christmas songs even though November isn’t out. In Other Words can’t help playing some jazz, it’s what they do, given the chance. Herbie Hancock’sWatermelon Man is a favourite, similarly Georgia. Alex played as well as ever, be it ballad tempo (Georgia) or a full steam ahead Caravan. Brother Dylan has the Juan Tizol/Duke Ellington drum part down to a tee. Metro passengers to and from trains stopped by to listen. One couple said: The alto player and drummer are really good, and the left-handed guitarist can play. The couple have ears. The guitarist, the one who can play, is Nathan Lawson. 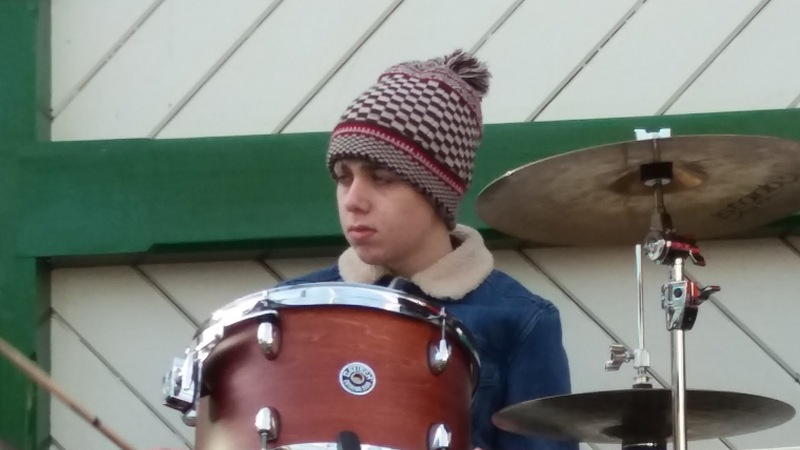 The Gretsch-playing young man featured on Christmas Time is Here. Lots of Joe Pass-like stuff going on here. Marvellous. Remember it’s Christmas time…almost. Rudolph the Red Reindeer (all together now…), the trio’s signature tune, Fly me to the Moon and a reprise of Let it Snow! Let it Snow! Let it Snow! The lads can play, that’s for sure. They played for a fee, rightly, and they made more than a couple of bob with not one but two strategically placed collection buckets. A pleasant, if cold, hour and a quarter, be sure to check out In Other Words. Ken, these young lads are veterans of the Jazz Cafe's jam session. There is the possibility that they could turn up at the last session of the year on Tuesday 19 December. It would be good to see you there. Ah ! Tnx Russell, good to hear ! Great review Russell thank you! You're right Andrea, Paraffernalia is another of the bands! Will the band be competing at next year's Great North Big Band Jazz Festival, I wonder? It's hard to believe that Jazz Attack wasn't/isn't one of their bands! Hopefully Paraffernalia will be there Russell. Although we really could do with recruiting some new members as numbers in the band have really dwindled this year due to so many going off to university!